Austrocylindropuntia subulata f. monstrosa is a large tree-like cactus, up to 13 feet (4 m) tall with round cylindrical joints, up to 1.6 feet (50 cm) tall and up to 2 inches (5 cm) thick. 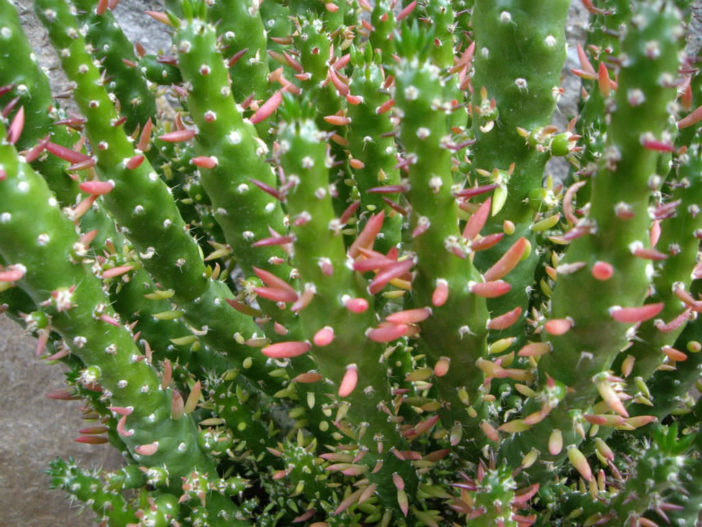 The green leaves are nearly cylindrical, up to 2 inches (5 cm) long. The spines are light yellow, up to 6 inches (15 cm) long. The flowers are red, up to 4 inches (10 cm) long. Though the large variety of species within the Opuntia genus means different types of prickly pears may need slightly different care, all are desert cacti that need lots of sun, lots of light, and very little water. 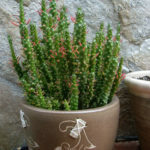 If you live in a hot, arid area – particularly the American Southwest – these plants can generally be planted outside, left alone, and enjoyed. 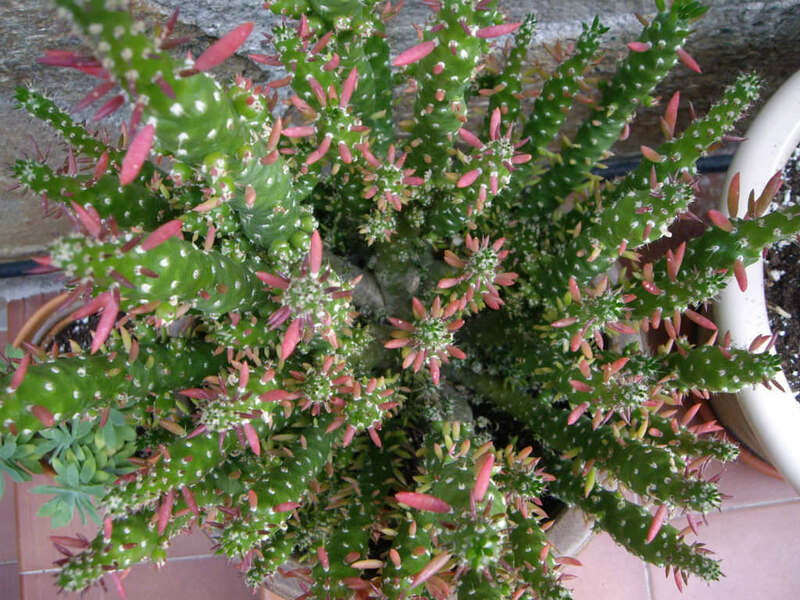 Though Opuntia will grow just fine in a garden, they can be grown in pots as well. To repot, ensure the soil is dry, then remove the pot and knock away the old soil. 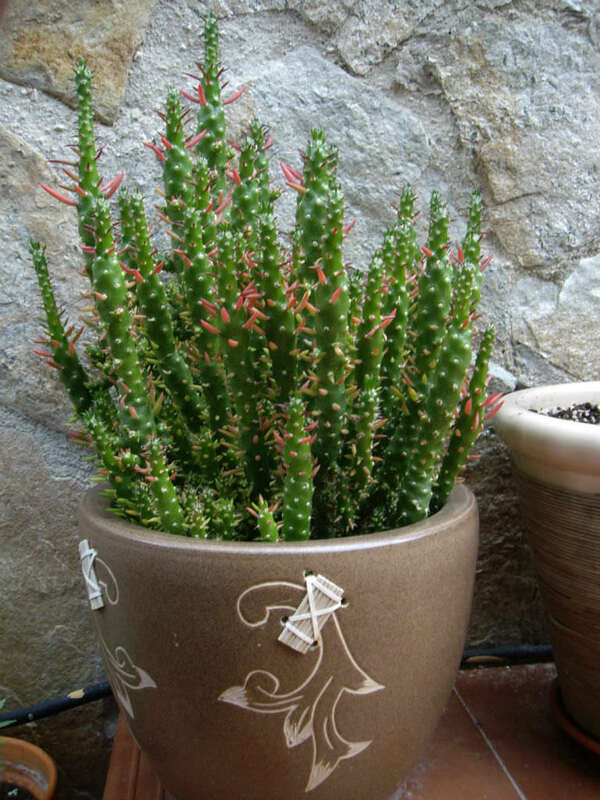 After treating any cuts with fungicide, place the prickly pear in a new pot and backfill it with potting soil. 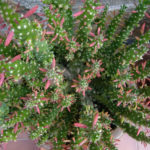 As with a new cutting, make sure not to water a newly repotting prickly pear for a brief period to avoid rotting its roots… – See more at: How to Grow and Care for Opuntia.